Posted 2 February 2015 & filed under 1970s, 1980s, Life and leisure, People, Pubs and clubs. A social club, called the Cottonmill Club, was launched in 1970s to provide community facilities for the residents of the new Cottonmill and St Julian’s estates. Membership was by subscription and in its heyday it attracted over 2,000 members. It was situated approximately where the car park to the Marlborough Pavilion is today in Old Oak, Cottonmill Lane although Old Oak wasn’t there then. It closed in 1994 following a fire but it was in financial difficulties by then. Carol Leighton says that: “the club first started when a few of us young ones at the time had nowhere much to go, so a few parents started up a youth club for us in a Nissen hut behind St Julian’s Church on the dual carriageway in Abbots Avenue. This would have been in 1963 or 1964. My best friend’s late father was one of these parents, his name being Ken Gaylard. There was also Mr Wilson from Maynard Drive and four or five others. We had the youth club a couple of times a week, and on a Monday night they used to run Bingo and a raffle in order to raise funds. Socials were also arranged these being in the Nissen hut and Mandeville school hall. It was then called the Cottonmill Residents Association which was run by about six people including Ken Gaylard, Eric and Joan Wilson, a lady called Brenda who lived on Abbots Ave about opposite the butchers, on the corner. I can’t remember the others. Gradually the funds grew in order for plans to be submitted and to build the Cottonmill Club in the playing field in Cottonmill Lane. Money was raised for nearly seven years and the Cottonmill club opened in about 1971. 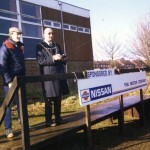 Many residents then helped the initial six to run the club. The youth club also helped with the over 60’s on the estate laying things on at the hall, beetle drives etc. Sadly the club is no longer but if it hadn’t been for those first few parents it never would have been.” Carol remembers that she and her friend helped to paint the hut: “it was done in huge stripes with any leftover paint we could lay hands on, It was to make it brighter and cleaner than having it black. Such happy times and community spirit, we helped with fetes too, because we helped at the onset it was a big achievement to see the club built”. Russ Bowman says that some of the original names were Arthur Stonham, Brenda Crowney and a man called George. 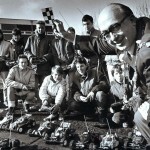 In 1987, a model radio-controlled racing car club was set up by Vic Foster. Called St Albans Buggy Club, it lasted for several years. It closed because of vandalism. The name mentioned as ‘George’ might well have been ‘George Wright’! I remember seeing Mum (Mrs Joan Wilson) being asked by the beer delivery driver to open up ‘The Club’ so he could make the delivery. Dad (Eric Wilson) being the Secretary, spending far too many hours ensuring all was well with the running of the club. It began as a social thing, but turned out to be so much more than a hobby. Great times and memories of working in the bar when short of personnel. Hi Graham, Carol Leighton nee Rosher remembers you and your mum and dad and would like to get in touch with you. She says you went ballroom dancing with them and partnered Linda Stuckey who lived next door to you, She says she has a photo of you all. Leave a message on info@Sopwell.org.uk and I will pass on her details to you. Surprised no one mentioned the cottonmill club carnival, my grandad used to lead the procession in his austin morris with PA speakers strapped to a roof rack. Blasting out fairground organ music from a reel to reel tape recorder on the passenger seat. He also used to compare on the stage in the dance hall, think he may also have been entertainments manager. My Grandparents lived nextdoor to the Nissen hut. Vaguely remember the prize bingo played there i must have been about 5 or 6 lol. Just to clarify my grandad was Arthur Stonham no E he would have hated seeing his name spelt with an E lol. My grandma was Hilda they both spent a lot of time, as others making the club a great place to go. Good memories Gary. Thanks. I have taken the “e” out of Stonham! Lovely to hear that Gary knew his son John well .If you would like the photo of your Grandad with Mr Hibbert you are very welcome.Please contact Sandy and I will ask her to forward it to you. Hi Gary good to hear from you.Knew your Grandparents son John in the 50’s .If you would like the original of the photo of your Grandad with Mr Hibbert you are welcome .Please contact Sandy and I will ask her to forward it to you.